APA Div. 12 members please log in to your customer account and sign up for discount there. National Register of Health Service Psychologists (NATREG) members please enter your discount code during checkout. This authoritative but compact text addresses the psychopathology, assessment, and treatment of the anxiety disorders and phobias in childhood and adolescence. These perplexing conditions are the most prevalent psychological difficulties in young people and result in considerable impairment and distress, not only to the child but also to her or his family. Effective treatments exist, but unfortunately many of these interventions are either not known to the practicing professionals or not used by them. This volume aims to address this gap and to present these interventions in a clear and straightforward manner. "[A] terrific standalone resource... timely and relevant... [The authors] provide a strong summary of the current research and illustrate how this research can be used in evidence-based clinical practice. ...and aterrific appendix full of useful and relevant tools and resources. "[the] primary target audience is psychologists, but the book is also written at a level to target clinicians across other healthcare disciplines, such as primary and specialty care physicians, nurse practitioners, physician assistants, social workers, and other mental health counselors." "A state-of-the-art reference for the conceptualization, assessment, and treatment of anxiety disorders in children and adolescents. Clinicians will find the book thorough, concise, and accessible. "This resource likely would appeal to a wide range of mental health practitioners, including psychologists, social workers, school counselors, and psychiatrists. Students in psychology may also find this resource helpful, as it establishes the foundation for working with anxious youths. "Perhaps the strongest aspect of the book is its accessibility. The authors provide a variety of tables with key information in a user-friendly manner, such that a clinician can easily locate needed information. The writing is clear and engaging, and key points are bolded throughout the book. The appendix contains useful tools, including sample relaxation scripts and anxiety measures. Ideally, user-friendly resources such as this one will continue to inform clinicians of empirically supported treatments." "This informative book describes the various ways that anxiety can be detrimental and interfering for children and adolescents, and explores the course of anxiety development, methods for its assessment, and considerations in its treatment. The writing is concise and up-to-date, and guided by evidencebased clinical practice. No hocus pocus, just well-informed guidance." "Anxiety disorders of childhood in a perfect nutshell. If you are looking for a concise, thorough, and bang up-to-date book, then this is the one!" 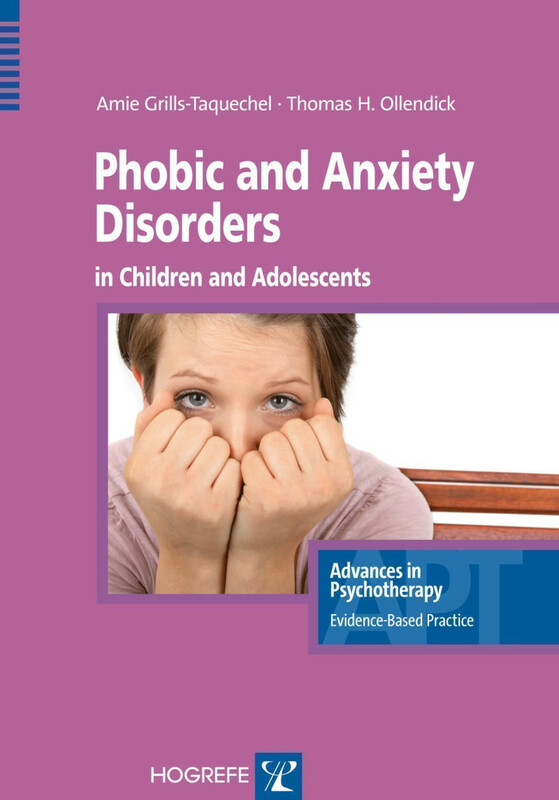 "This book contains a wealth of information about the nature of phobic and anxiety disorders in young people and their assessment and treatment. It will be of enormous value to mental health practitioners, providing them with clear and detailed information about state-of-the-art practice." "Research on anxiety disorders in children and adolescents has sky-rocketed during the last two decades and we now know much more about the etiology, prevalence, consequences, and treatment of these disorders. In just 90 pages this volume provides the reader with basic knowledge about background, diagnoses, assessment, psychological and pharmacological treatments, and their evidence-base. This book should be required reading for students interested in and professionals working with children and adolescents." "In recent years the number of scientific studies on anxiety disorders has grown exponentially. This book provides a comprehensive and thorough review of theoretical explanations, evaluation, and evidence-based treatments of anxiety disorders in children and adolescents. As expert researchers and practitioners, Grills-Taquechel and Ollendick provide an important resource and up-to-date reference work for professional psychologists and students alike."